Hello, I'm Kristen, occasionally known on blogger as Kristen Quixotic. This is me and a pinata! 1. More than anything I would like to work at a fashion magazine and do page layouts. 2. I have a ten year old Golden Retriever named Penny. 3. I grew up in a small town in Rhode Island and hate that I still live there a few months out of the year. 4. I attend school in Boston, Massachusetts and love almost everything in Boston. 6. I have a tattoo of the word Love on my wrist and want to get a bird cage on my forearm next. 7. I (not so) secretly want to be a pin up girl. 8. I don't drink soda or anything carbonated. 9. I want to live in Europe for at least a year after college. 11. I will purchase basically anything with a pattern, design or vintage-looking picture. I'm pathetic in that way. 12. I read a lot. 13. I'm sort of a stickler for proper grammar and I try to speak correctly even in text messages. 14. I work at a shoe store and thus own more shoes than I care to admit. 15. I get more excited than you could ever guess when I have a new follower or comment or view on my blog. Thanks for sticking with me through my fifteen facts. Here's the full challenge; I hope you give it a shot too! hahha thanks. 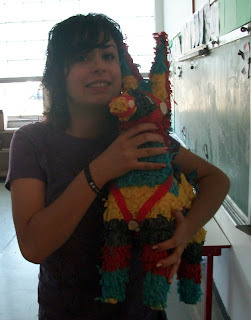 =] my friend handed me a pinata and was like make an awkward face; its one of my favorite pictures of myself.